Indonesian has a lot variation of oriental chicken recipe, and Grilled chicken with coconut milk and sweet soya sauce is one of the best Indonesian recipes. If you are looking for something different tonight, maybe you could try this Asian chicken recipe. This dish can be combined with fresh salad and warm with rice and it would be an excellent meal for the lunch or even evening meal. This is also very suitable for little children because this oriental recipe has a sweet taste and doesn't contain any chilies which make dishes a little bit spicy. Make a smooth paste of red chilies, coriander, garlic, turmeric, candlenuts, cumin, pepper, salt and sugar. Set aside. 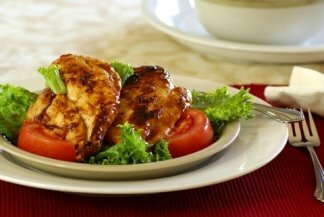 Cut the chicken breast in 2 parts, rub with vinegar or lime juice, and wash with clean water. Heat the oil in a wok and fry the paste, together with Kaffir lime leaf, lemon grass, ginger and galangal until fragrant. Set on middle heat and add the chicken and stir it until the chicken is starting to stiffen. Pour in the coconut milk and let it simmer until the chicken is half done. Add the thick coconut milk and continue cooking until the fluid is reduced and the chicken is tender. Mix the melted butter with the sweet soy sauce and brush it all over the chicken. Grill the pieces of the chicken over a low fire until they have golden brown color. Ready to serve with fresh salad and sambal.